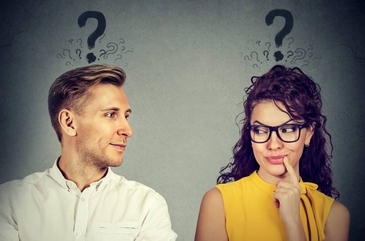 It's clear in the picture above that those two are attracted to each other, but they are equally clearly agonizing over who should make the first move. In a checker problem, the first move is often critical, too. We've written before about the excellent practice site Checker Cruncher, and we do stop by there every so often to try our luck on the site's large collection of interactive checker problems. We highly recommend it. Site creator Brooks Thomas kindly gave us permission to republish Checker Cruncher problems that we find interesting, and the one below got our attention. Naturally, it's all about that first move. There's only one move to win; everything else will draw or even lose. Can you make the first move by finding the first move? Solve the problem, and then make your next move clicking on Read More to check your answers. 22-17---A,B 2-6 24-20 5-9 23-18 1-5 31-27 and Black is out of safe moves. White Wins. A---11-15 17-14 is an immediate win for White. 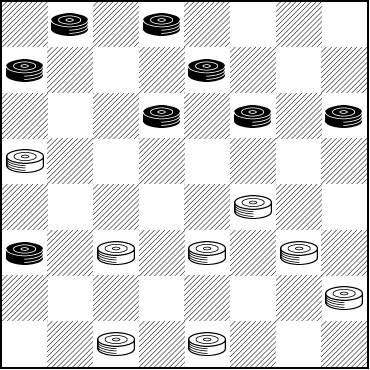 B---11-16 24-20 7-11 31-26 2-6 28-24 5-9 26-22 1-5 22-18 and again Black is out of safe moves. White Wins. Was your first move a success? We certainly hope so, but in any case we hope you enjoyed this problem provided courtesy of Checker Cruncher.